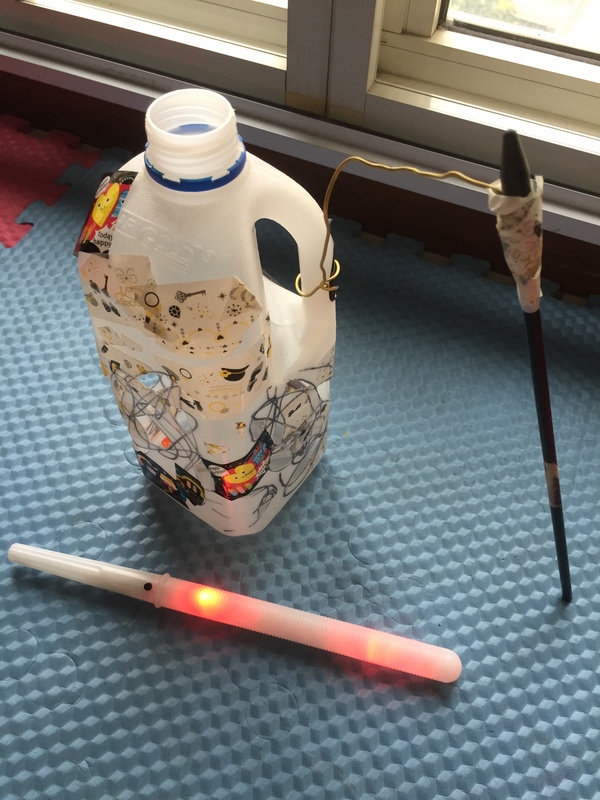 Mid Autumn Festival is here again and this year our little monster’s childcare prompted us to be very resourceful and make our own lanterns from recycled materials. As always they encourage the kids to take part in the making of said lantern however it is difficult to have a two and a half year old to sit and do anything. After viewing some of the other family’s designs it seems I wasn’t the only one that had that difficulty and parenting instinct (ala competitive nature) took over. Some designs a 10 year could not put together let alone a two year old. I felt that i needed to stay grounded and give as much freedom of design as I could to the little fella. First I took one cleaned milk bottle devoid of all labels and let the little monster go to town on it with a black texture (marker). This made for some interesting shapes. Some of the these shapes were then cut out to allow for the internal light to pass through which gives the lantern effect. For decoration we had some left over decorative tape that he enjoyed placing all over the bottle. The light source was a cotton candy stick that gave off brightly coloured flickering lights. It was finished off with an old windmill stick for him to hold. Singapore had experienced some of the worst haze on record during the mid Autumn Festival this year. This would not be a deterrent from the boys having fun so we turned off all the lights in the apartment and the boys had a wow of a time walking throughout using the lanterns to light their way. An inexpensive and fulfilling way to spend with the boys.